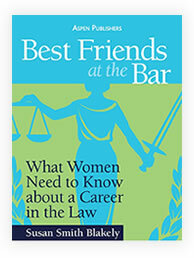 I welcome public speaking opportunities to discuss key issues addressed in my Best Friends at the Bar books for women lawyers and What Millennial Lawyers Want: A Bridge from the Past to the Future of Law Practice for ALL young lawyers. My programs are consistently approved for CLE credits. If you would like to arrange a speaking engagement, please contact me at [email protected]. The presentations for women lawyers address the low retention rates for women lawyers due to lack of systemic support for the issues of work-life balance and gender parity that affect so many women lawyers. My research and conclusions detail the benefits of change for lawyers and law firms and the approach that young women lawyers take to their careers. *The Responsibility of Law Firm Leaders to “Lean In” on Retention Issues. 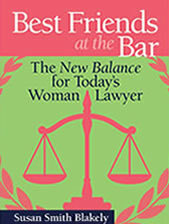 The Women’s Bar Association of Maryland was honored to host Susan Blakely in September 2010 at the University of Baltimore School of Law to discuss her book. Susan is an interesting and personable woman who took the time to talk one on one with attendees before speaking. 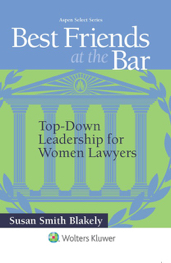 She truly is an inspiration to women lawyers – both brand new and seasoned alike – and has some amazing insight into surviving in the legal field. I only wish she had written her book before I went to law school! 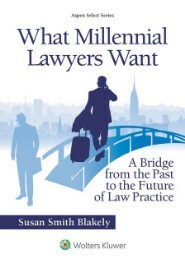 I would not only recommend it as a must read for any young woman contemplating a legal career, but as an attorney with 10 years of experience and a young family, it spoke to me as well. The presentations for ALL young lawyers are non-gender specific and address what today’s young lawyers want, how young lawyers and law firms need to work together to meet the needs of today’s young lawyers and the Soft Skills young lawyers need to advance in their careers. Speaker, Presidential Inaugural Scholarship Summit, Washington, DC, January 2017. Keynote Speaker, Association for Women Lawyers of Greater Kansas City, Kansas City, MO, October 2012. Speaker, University of Detroit Mercy School of Law, Detroit, MI, October 2012. Panelist, Ms. JD National Conference, Washington College of Law, American University, Washington, DC, October 2012. Speaker, National Conference of Women’s Bar Associations Leadership Summit, Chicago, IL, August 2012. Speaker, National Conference for College Women Student Leaders (AAUW), University of Maryland, Baltimore, MD, June 2012. Speaker, Paul Hastings Law Firm, Chicago, IL, December 2010. If you would like to arrange a speaking engagement, please contact Ms. Blakely at [email protected]. Book Review: The Virginia Lawyer, October 2018, Volume 67.